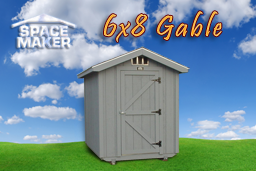 If you are looking for an outbuilding to house your stored materials, yard equipment, or even a workshop or private room, our gables are the perfect solution. 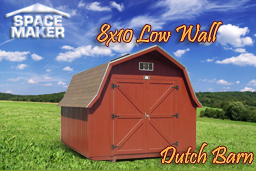 With the triangular gable between the A-frame roof and the walls that give the structures their names, these outbuildings are fascinating and fashionable, working for any usage that inspires the need for more room on your property. 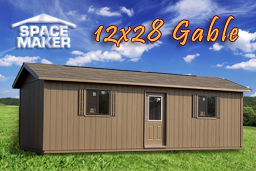 Built to the same sturdy standards as all Space Maker Portable custom buildings, you can trust the high quality materials and the custom design of your gable as well. 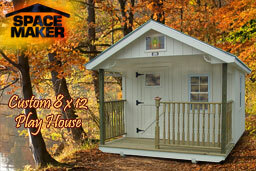 Take a look at what we have to offer, and call us to create the building that merges perfectly to your landscape! 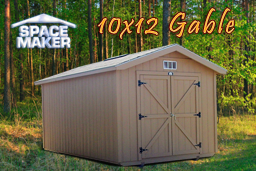 The 10x12 size is perfect for a portable mini storage building for ATV, bicycles and much more. A versatile solution to whatever storage need is at hand. Customizable floor plans, you can easily work this design to meet your needs, regardless of your decision of how to use the building. 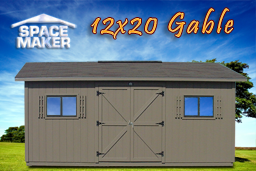 Our buildings are not only pleasant to look at but also sturdy and efficient. 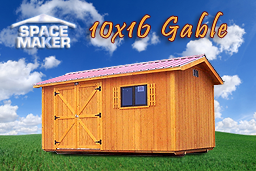 Woodworking, pottery, scrap booking, or some other hobby or design fits perfect in this gable.